[21. 12. 2016] Today, the December issue of AGF EuropaNews was published. As usual, it provides you with news about the most important developments concerning family policy at the European level and from the European states. You will also find links to reports and studies as well as interesting upcoming events. Unfortunately, our newsletter is only available in German. ... more on "EuropaNews December 2016"
[30. 11. 2016] Today, the November 2016 issue of AGF EuropaNews was published. As usual, you will find the most important developments concerning family policy at the European level and from the European states. It also provides you with links to reports and studies as well as interesting upcoming events. Unfortunately, AGF EuropaNews is only available in German. ... more on "EuropaNews November 2016"
[22. 11. 2016] On 17th November, AGF invited to a discussion with Prof. Dr. Anne Lenze and Prof. Dr. Joachim Wieland about reforms for a just subsistence level for children. Under the title "Small adaptions or a radically new system - how do we achieve a just subsistence level? ", the two experts presented critical aspects as well as possible solutions. They presented their ideas and discussed them together and also with the particpants. ... more on "AGF Discussion on German subsistence level for children"
[15. 11. 2016] 16 family organisations, children rights organisations, social welfare organisations and trade unions call for quality standards in daycare facilities for children. Jointly they welcome the process that was started by the state on national and federal level to increase the quality in child care and expect concrete outcomes. ... more on "Joint declaration on quality standards in daycare facilities for children"
[31. 10. 2016] The October issue of AGF EuropaNews provides information about recent family policy related news from Europe and the European Union. It also comprises references to studies, reports and upcoming events. Unfortunately, AGF EuropaNews is only available in German. ... more on "EuropaNews October 2016"
[13. 10. 2016] On the occasion of the government's decision to raise child tax allowance, child benefit and child benefit supplement, the AGF calls not to forget the announced reform of advance maintenance payment for children. A draft law has to be released quickly and must not be dropped because of disagreements on its financing between Bund and Länder. ... more on "Press Release on advance maintenance payment and child benefit supplement "
[06. 10. 2016] AGf invites to a discussion with Prof. Dr. Anne Lenze und Prof. Dr. Joachim Wieland on reforms of meeting the subsistence minimum of a child. The two lawyers will be discussing the topic between each other and together with the participants about ways how to achieve a subsistence minimum of a child. The debate will be on 17 November 2016, 13.30h - 16.00h in Berlin. ... more on "AGF - Event on the subsistence minimum of a child"
[30. 9. 2016] The September issue of AGF EuropaNews was published today. It contains the most important developments concerning family policy at the European level and from the European states. Furthermore we have compiled information about topic related reports and studies as well as upcoming events. The newsletter ist only available in German. ... more on "EuropaNews September 2016"
[19. 9. 2016] Yesterday, Sunday 18th, the central World Children's Day Festival took place in Berlin at Potsdamer Platz. AGF happily took part and invited children and grown-ups to get informed about AGFs and the family organisations work and their current main topic and to jointly feel "blindly" items from a family's every day life. ... more on "AGF at World Children's Day Festival"
[19. 9. 2016] UPDATE 29 Sept.: Updated Program! -- COFACE - Families Europe and AGF are jointly organising the conference 'The impact of digitalisation on 21st century families' on 7-8 November in Berlin. Experts and stakeholders will get together to discuss this topic, aiming to stimulate debate, put some practical examples out there, and take a peek at what the future will bring. 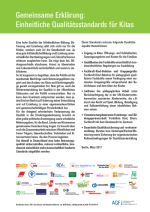 ... more on "7 - 8 Nov, Berlin: The impact of digitalisation on 21st century families"
[31. 8. 2016] Today, the newest issue of AGF EuropaNews was published. As usual, it provides you with news about the most important developments concerning family policy at the European level and from the European states. You will also find links to reports and studies as well as interesting upcoming events. ... more on "EuropaNews August 2016"
[29. 7. 2016] The newest issue of AGF EuropaNews provides information about social and family policy related news from Europe and the European Union. It was published today and also comprises references to studies, reports and upcoming events. Unfortunately, AGF EuropaNews is only available in German. ... more on "EuropaNews July 2016"
[30. 6. 2016] The June issue of AGF's EuropaNews has been published today. It contains an ovierview of family policy related news from the EU and the European states. You will also find links to reports and studies as well as interesting upcoming events. Unfortunately, EuropaNews is only available in German. ... more on "EuropaNews June 2016"
[28. 6. 2016] On Monday, 27 June experts from different European states discussed possibilities on meeting the subsistence minimum of a child. The meeting took place in Berlin. Besides a detailed introduction in the controversial topic, examples from Austria, Belgium, Great Brittain and France served as basis for the discussions. ... more on "European Expert Meeting on the subsistence minimum of a child"
[7. 6. 2016] The Eco Festival named "Umweltfestival" around the Brandenburger Tor already has become a tradition in Berlin. This year it has taken place on the 5th June and like the years before the AGF has joined the festival to present itself and its work. ... more on "AGF at Eco Festival"
[31. 5. 2016] The May issue of AGF EuropaNews was published today. It contains the most important developments concerning family policy at the European level and from the European states. Furthermore we have compiled information about topic related reports and studies as well as upcoming events. The newsletter ist only available in German. ... more on "EuropaNews May 2016"
[29. 4. 2016] The current issue of the AGF „EuropaNews" for April 2016 was published today. It contains news on family policy on the European level and in Member States of the European Union. You will also find links to new reports and studies as well as interesting upcoming events for the next few weeks. The News" are only available in German. ... more on "EuropaNews April 2016"
[7. 4. 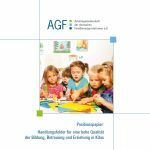 2016] On occasion of the current debate on quality child care facilities AGF has published a position paper. The German family organisations aim for high quality child care facilities. Therefore in their position paper they suggest concrete criteria for quality standards. ... more on "High quality child care facilities"
[31. 3. 2016] Today, the March issue of AGF EuropaNews was published. As usual, you will find the most important developments concerning family policy at the European level and from the European states. You will also find links to reports and studies as well as interesting upcoming events. ... more on "EuropaNews March 2016"
[18. 3. 2016] The German Federal Council (Bundesrat) today discussed a draft bill on the simplification of the social code book II (basic social benefits). On this occasion the German family organisations ask for an benefit meeting the particular additional needs of children of separated parents, if the parents receive basic social benefits. The current draft only continues the shortage management between the parents and aims mainly for relieving the public budget. AGF requests a law that takes into account the actual needs of children for a secured existence. ... more on "Meeting the additional needs of children of separated parents"
[7. 3. 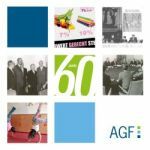 2016] AGF has published a joint declaration with Deutscher Gewerkschaftsbund (DGB), Deutscher Frauenrat (DF), Bundesforum Männer, Zukunftsforum Familie (ZFF) an Sozialverband Deutschland (SoVD) promoting improved measurements für employees who want to increase their working hours when working in partime. ... more on "Joint declaration on part time work"
[29. 2. 2016] The latest issue of AGF EuropaNews was published today. As usual, you will find the most important developments concerning family policy at the European level and from the European states. You will also find links to reports and studies as well as interesting upcoming events. ... more on "EuropaNews February 2016"
No restriction of family reunification for refugees! [18. 2. 2016] The family organisations appeal to the Members of Parliament not to agree to the restrictions of family reunification as planned in the law called Asylpaket II. Children and Families will thus be forced to the dangerous flight themselves and a successful integration for those already accepted in Germany will be considerably more difficult. The unity of the families has to be secured, as it is stated by european law. The new asylum act that, tomorrow, will be discussed in the Bundestag, proposes a suspension period for the family reunification of two years for refugees with a so called "subsidiary protection". ... more on "No restriction of family reunification for refugees!" [29. 1. 2016] 2016's first issue of AGF EuropaNews as usual contains an overview of recent developments in Europe concerning family and social policy. It also covers reports and studies as well as upcoming events. One of this month's highlinghts is eurofound's report on European family policies during the economic crisis. ... more on "EuropaNews January 2016"